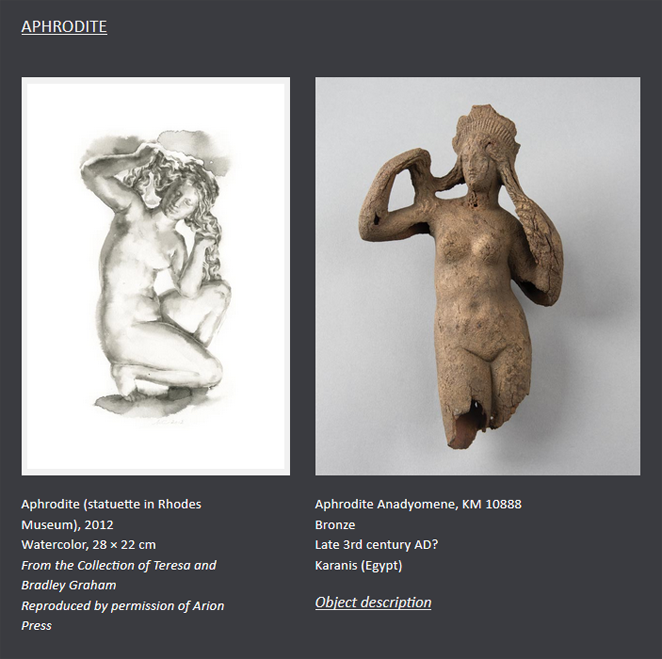 This website was created in conjunction with the interdisciplinary exhibition Rocks, Paper, Memory: Wendy Artin’s Watercolor Paintings of Ancient Sculptures, presented by the Kelsey Museum of Archaeology in summer and fall 2015. 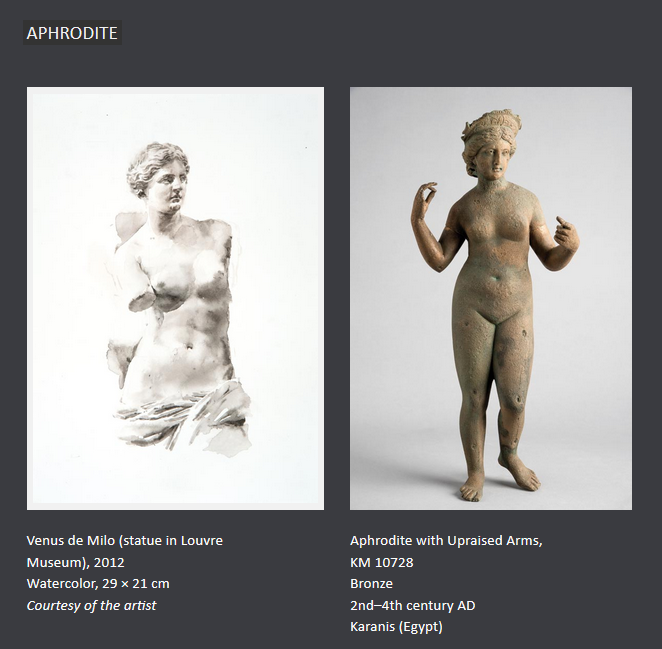 The exhibition, curated by Christopher Ratté, reflects on inspiration, emulation, and realism in ancient and contemporary art; it features a series of watercolor paintings of ancient Greek and Roman sculptures, created by Wendy Artin, an American artist who lives in Rome. These stunning pictures are displayed alongside ancient objects from the Kelsey Museum’s collection; the show also includes other aspects of Artin’s work, such as figure paintings and Roman landscapes. The central piece of the online exhibition is a series of large-scale paintings representing the Parthenon frieze, a band of relief sculpture, running around the wall of the Parthenon temple in Athens. The subject of the frieze is a long procession, consisting of a cavalry parade; toward the head of the parade are men and women bearing offerings or leading animals to sacrifice. The desktop version of the website displays all six of these life-size watercolors as a continuous band, while in a real gallery space they could not be placed on the same wall. Another unique project highlighted in the exhibition is a group of small-scale paintings created for Stone from Delphi, a limited-edition volume of poems by Nobel laureate Seamus Heaney. Wendy Artin was commissioned to produce a series of pictures to accompany the book, and she chose to make watercolor paintings of ancient sculptures of gods and heroes featured in Heaney’s poems. Original paintings in the series are presented here, including those reproduced in the book and several that have not been previously published. The exhibition at the Kelsey Museum showcased Wendy Artin’s paintings in the context of ancient sculptures, figurines, and coins from the museum’s permanent collections. The online version of the exhibition takes a further step, placing some of the watercolors in direct dialogue with ancient objects. The website also features an essay written in a form of dialogue between the curator and the artist. 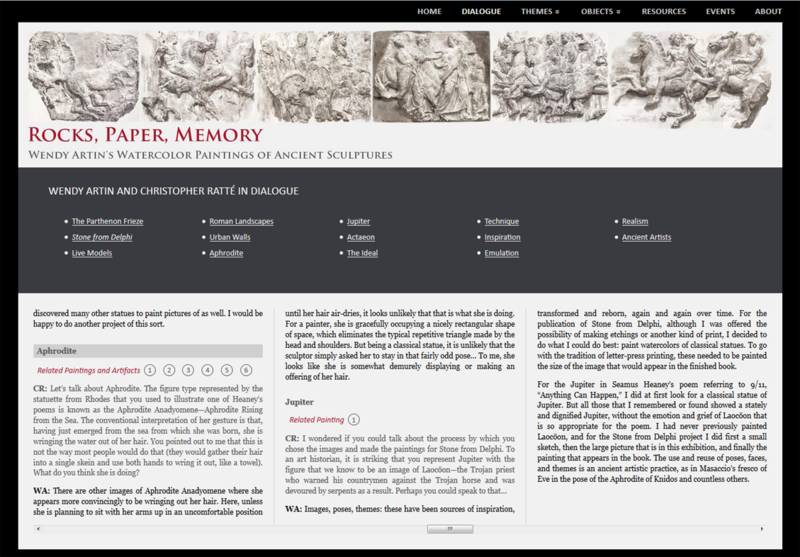 To mimic a printed article, and to further emphasize the horizontal movement of the Parthenon frieze, the dialogue is presented as a horizontal sequence of columns of text (desktop version); it includes hyperlinks to related paintings and objects. Each of the theme pages is also accompanied by an excerpt from the dialogue. 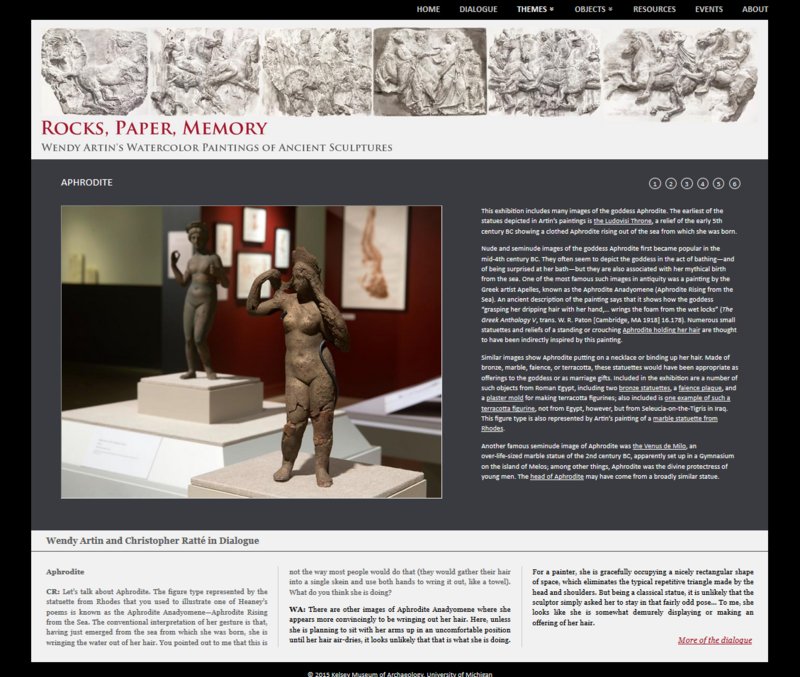 The Rocks, Paper, Memory website was conceived and implemented in house. It is fully responsive and targets diverse audiences, including art lovers, students, and scholars.